During the school year my children went on a class trip to a wolf preserve. Both my 3 yr daughter & now 5 yr old son went on the trip with their preschool classmates from school. My daughter told me before the trip that she didn’t want to go. I just brushed it off and told her that there was nothing to be afraid of and that it would be like going to the zoo which we often go to.After the trip, my son came home all excited and showed me how he could make howling sounds just like the wolves, but my daughter didn’t say much. That night my son teased her a lot with the howling and she started to get upset. I told him to stop and then we forgot about the wolves. After our nightly routine of brushing teeth, bedtime story, and prayer – everyone went to bed. Around 10:30pm, my daughter woke up screaming. I ran to her room and tried to console her. She just sat there in her bed rocking back and forth saying “I want my mommy” between cries. I tried everything to get her to stop crying and realize that I was there. But it seemed like she was stuck in her dream even though her eyes were open. It was the oddest thing. After she calmed down (after about 20 minutes) I laid down with her in her bed and gently stroked her face and rubbed her back. I tried to ask her what happened and if she had a bad dream. She shook her head yes and then told me that she didn’t want the wolves to get her. I started to feel horrible, because I knew she didn’t want to go on the class trip, but at the same time I didn’t want her to back out because of fear. It is so much better to face your fear head on so you can get over it easily. My daughter has always been a bit afraid of dogs and prior to the class trip her preschool teachers were teaching the class about wolves and doing crafts and things like that. So, she knew ahead of time what she was going to see and she was scared about it. I really had no idea though, that she would come home and start having nightmares about it. It has been 2 or 3 months since the trip and still she has nightmares at least once a week. Sometimes they are just plain nightmares and sometimes they are night terrors. I did some research on night terrors and found that they are actually a common sleep problem in children. 15% of young children have them occasionally and the most common ages are between 2 and 6 years old. When you hear how most experts describe night terrors, it is easy to see why parents find them distressing. Children who have night terrors are usually described as ‘bolting upright’ with their eyes wide open, with a look of fear and panic, and letting out a ‘blood curdling scream’. These kids will usually also be sweating, breathing fast and have a rapid heart rate (autonomic signs). And although it will seem like they are awake, during a night terror, children will appear confused, will not be consolable and won’t recognize you.Typical night terrors last about 5 to 30 minutes and afterwards, children usually return to a regular sleep. If you are able to wake your child up during a night terror, he is likely to become scared and agitated, mostly because of your own reaction to the night terror, especially if you were shaking or yelling at him to wake up. Instead of trying to wake up a child having a night terror, it is usually better to just make sure he is safe, comfort him if you can, and help him return to sleep once it is over. The diagnosis of night terrors is usually made by the history of a child ‘waking’ early in the night screaming and being inconsolable. 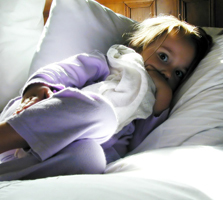 Night terrors are most often confused with nightmares, but unlike night terrors, a child having a nightmare is usually easily woken up and comforted.The other worry for many parents is that these episodes are a type of seizure. Although different types of partial seizures, including temporal lobe and frontal lobe epilepsy, can appear similar to night terrors, they are usually brief (30 seconds to a few minutes) and are more common in older children and adults. No treatment is usually necessary for routine night terrors. Since they are often triggered in children who are overtired, sticking to a good bedtime routine and making sure your child is getting enough rest can help to prevent them. For children who get frequent night terrors, it might help to wake your child up before the time that he usually has a night terror. This is thought to interrupt or alter the sleep cycle and prevent night terrors from occurring (it also works for sleepwalking). Similar to sleepwalking and sleeptalking, night terrors are considered to be a disorder of arousal and are a partial arousal from non-REM sleep. Unlike a nightmare, children usually don’t recall having a night terror. Also unlike nightmares, night terrors usually occur in the early part of the night, about 1 to 4 hours after going to sleep. The odd thing is that my daughter is not really over tired, because she does nap during the day. But I might try waking her up and see if that works. Because my daughter has no recollection of the nightmares then they would be considered night terrors. They also happen about 2 hours after she falls asleep – never any later than that. I am really hoping that she will grow out of this. We have been praying over her each night as well. Do you have a child that has suffered from Night Terrors? What did you do? I really need some support with this one. I have suffered from night terrors most of my life. I believe is it spiritual. There is a scripture that talks about “our fight is not against flesh and blood, but against the powers and principalities of darkness”…. (sorry that’s not exact). At the risk of sounding like a crazy person, I would pray over my daughters room before she goes to bed at night. Look up scriptures on sleep, fear, ect. to pray over the room. I would also (thru scripture)bind any “weapons formed against her”, etc. I know when my kids have had a bad dream, that momma-bear syndrome stirs up in me and I get all sorts of angry because I don’t like my kids to suffer that way. Pray with her when she goes to sleep. And ask the Lord to reveal to you any other things that maybe she is being exposed to that is causing her fear. Like a cartoon or something. We don’t do “Scooby Doo” because we felt like the Lord told us it would scare our kids. While I thinks doctors, research and medicine are great….. the Lord showing her mommy how to help her trumps them all. Really…. I’m not a nut. But I believe that bad dreams are spiritual and thru prayer… can be stopped. Good luck. Please let me know how it goes. .-= jallwood´s last blog ..Missing my baby =-. My youngest daughter, who is now 17…ugh, had horrible nightmares when she was young. She would wake up crying every night, saying she had a bad dream and come in our room. I would take her back to her room and pray over her and she would be fine the rest of the night.When I started praying specifically against bad dreams and for her to have good dreams, she stopped having the nightmares. The nights I didn’t pray specifically or at all, she would have the nightmares. I am not a nut either, but I agree as jallwood expressed, “our fight is not against flesh and blood…”, and nightmares and night terrors are spiritual. I will be praying for you and your daughter, too. I’m glad to read they don’t remember the night terrors. I know how awful it is to have a nightmare and then have the images return for a few days after. .-= Mary Lutz´s last blog ..10 MORE ways to use Ebooks to Boost your Business =-. My daughter’s night terrors started around age 2. They were incredibly frightening to witness. It was like watching a person have a seizure but being helpless to do anything. As you described, she would scream, cry and flail about (sometimes leaving bed) and not even notice that I was there to comfort her. In the morning, she had no recollection. When it escalated to “hallucinations” (waking up screaming that there were bugs on her, etc. ), we sought out professional help. We made several visits to specialists at Children’s Hospital, including participation in an overnight sleep study. Long story short, unfortunately, there’s no real “cure” other than to wait it out. We did make some changes, recommended by a sleep specialist, to try and ease some of the anxiety (for her and for me). Those included eating well before bedtime, trying to establish a regular bedtime routine, encouraging a “comfort item” (we never go anywhere without “Duck” – and she’s 5 now) and watching her diet, especially before bedtime. It was suggested to us that increased brain activity at nighttime increased anxiety and might lead to more night terrors, so just before bed, we try to wind down. We read stories and watch TV – but no games or anything that might stress her out. We were also advised not to talk about nightmares or other things that scare her because talking about it might make it worse. Of my three children, I only experienced this with my middle child. I know how very stressful it is – but it does get better. She’s 5 now and the episodes are incredibly rare. .-= Kelly Phillips Erb´s last blog ..Is Michael Jackson’s Doctor in Trouble with the IRS? =-. Personally, my experience has been similar to the above commenter. I’m not sure that all night terrors have spiritual significance, but many do. I’ve had them all my life until a few years ago, when I stopped them (another story). My daughter had nightmares and animal dreams are very common at ages 2-3. We knew hers was brought on my a particular stressor which we had no control over at the time. I repeatedly reassured her when awake about her being safe, etc. and I minimized things for her, pointing out the funny things about the animal or that they lived in Australia (when it was Kangaroos). I would pray over her so that she could hear that the HS would guard her mind and only allow what was filtered by HS in, claim protection as her parent that nothing had any right to go through her directly but had to go through me, told her she could talk to God b/c God was always with her, etc. I’m sure you do these things (interesting book in relation to this paragraph is I Give You Authority by Charles Kraft http://www.amazon.com/Give-You-Authority-Charles-Kraft/dp/0800792564 ). Anyway, obviously part is your daughter’s personality, experiences, natural development, and also, there could be a spiritual element. Even if there isn’t I think we can protect our children from some things through helping them understand, reassure and covering when needed. Probably, nothing you aren’t already doing! My oldest (now 21) had them when he was about 3 years old and they only lasted, thankfully, for about 3 weeks. We never discovered what caused them, but YES, they are more terrifying for the parent – as our pediatrician said, because the child doesn’t remember them. The best thing you can do is be there and try to comfort your daughter and ease her back to sleep, then try and get yourself back to sleep. She will probably outgrow it and then your routine will get back to normal and you will ALL have a good nights sleep again. .-= Lorie Shewbridge´s last blog ..Happy Birthday Sue – I Miss You =-. went through this when my son was 1 and half til’ almost 3 yr old TERRORS For sure. I have a three year old also. We haven’t had a problem with night terrors (yet, anyway) but thank you for giving such a comprehensive post. I feel better prepared if it does happen! .-= Janet Carpenter´s last blog ..wednesday0729 =-. my 6 year old son has them , he has had them for about 2 years now. I have noticed that he will only get them when he is really over tired, stressed or upset about something. he will wake up about an hour or two after he has gone to sleep and cry, scream, not notice we are there, and he will get up and walk around – all this while he is still in a deep sleep. The Dr. said not to worry about it, that it is something they will grow out of. .-= Tara H.´s last blog ..Celebrate with Solo =-. I personally haven’t dealt with this. I’m sorry you are though. My oldest son had night terrors. One night, after he got through being terrified and was able to realize I was in the room with him, I gave him his sister’s Barbie doll and told him that Dr. Stephie would help protect him. I have no idea why I decided to do it, I think I was just exhausted and desperate. But that child slept with Dr. Stephie every night, and he seemed to have fewer incidents. Maybe you could try a special stuffed animal or blanket? Keep us posted. .-= Mary@Everyday Baby Steps´s last blog ..It’s Been Awhile =-. My two older boys have had night terrors. They seem to also get them with growing pains. Not really sure if one has anything to do with the other but they are no fun ! .-= Debbie´s last blog ..Small Talk Six * Just Lazy * =-. My 2 kids, Roy 4, and Karen 2 years old, experience night terrors almost every day. is this somehting normal, or should i seek immediate edical advice? Roy has been having it for more than 2 years now, and Karen started few months back. It is very common at this age. My daughter still has nightmares at 4 1/2. The night terrors have lessened. While she was having the night terrors I noticed that she was talking about wolves. So, her night terrors were mostly about them. They had gone on a school trip to see wolves and ever since, that is when the night terrors started. It lasted for months and then I started talking to her about it. The night terrors did not stop right away. But I noticed that they were not happening as much. Have you tried talking to your son about it? I don’t think you need to seek medical help. But I know how hard this can be for you as a parent. Noone wants to see a child have night terrors. I am really sorry that you are having to go through this. I am just recoving from our first “night terror” I have heard this term before, but I really didn’t know what it was until just over an hour ago. My almost 3 year old princess woke up screaming. Eyes wide open. We couldn’t wake her, and we stopped trying after googling it. It seems you just have to wait it out. Our episode lasted somewhere between 20 and 30 minutes. I have never experienced something so freaky. We felt powerless. It was heart wrenching seeing your precious daughter suffer in complete fear and not be able to do anything about it. From what I have read, it doesn’t seem they remember, but I hope her subconscious is not being programmed by this. I hope we make it thought the night without another episdoe, and I really hope we don’t begin to see a pattern start forming. I am so sorry that you are having to go through this as well. It is such a difficult thing. My daughter is 4 now and the night terrors have seemed to subside. She does still have nightmares, but they are nowhere near as bad as night terrors. I wish you all the best. Thanks for the reply. We have had two nights with no issues; so, I am encouraged that this in not an everynight thing. We will be better prepared the next time it happens (mentally prepared that is). I know they don’t remember anything, but I have to thing unhealthy things are being burned into their subconscious. Makes me sad. I need help. My 2 year old woke up tonight not screaming but crying and flailing until my husband picked her up she wouldn’t quit crying when I asked her what was wrong she said “No I don’t want it” and curled up into me like someone was trying to give her something that she didn’t want. she would stop crying and stare into space for a minute then start crying again this happened several times then she says mommy I love you I told her that I loved her too but then she curled up into me agaon and started crying then she would be staring off into space snoring lightly and then her eyes would slowly clothes and she would be asleep for a moment then wake up crying again I didn’t know what to do and still dont if someone could please help me it would be appreciated. Oh sweety. I feel your pain. I have been there and it is so hard to watch your child go through a night terror. As I said in my post, it is much different than a nightmare which they remember. Night terrors they DON’T remember. It is really more scarry for us as parents than for them. Just know that you are doing the right thing. All you can do is comfort them and be there for them.